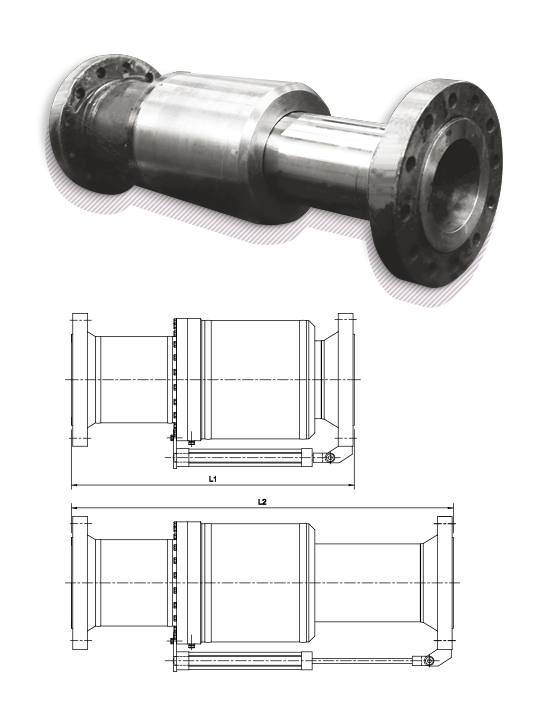 Den Holder Compensators (Expansion Joints) are designed, manufactured and tested to be completely safe compensators for pipe-works where quick mounting in and out of various components is required. The length differences that occur because of installing different types of components can easily be accommodated. The costs of ownership are low, since no more changing of spoolpieces is required and the number of studbolts and nuts that need to be loosened and tightened is reduced by 50%. Unbalanced compensators can slide in and out in a pressureless condition. This can usually be done by hand, but for larger sizes hydraulic or pneumatic cylinders can be mounted on the outside of the compensators. Balanced compensators have the advantage of being completely free of reaction forces. This means that these compensators are completely balanced and will cause no forces in any way when the line is under pressure. Balanced compensators will even compensate forces in the adjoining line pipe which are normally produced by variations in temperature or pressure.